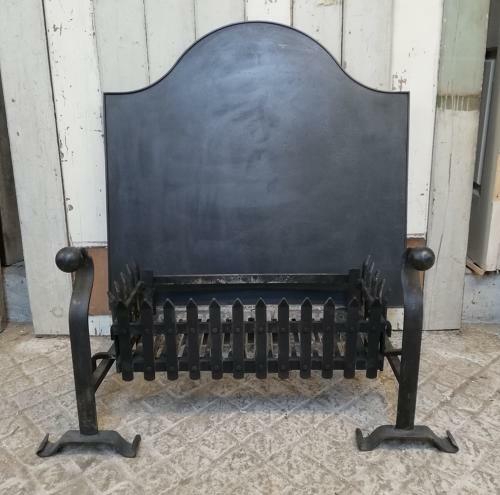 A reclaimed cast iron fire basket and iron fire dog set that can be used with a fire back. PLEASE NOTE this listing is for the fire basket and fire dogs only and photographed with the fire back for illustrative purposes only. The fire back is SOLD SEPERATELY, please see our other listings for details. The basket is traditional in style with spiked finials to the front and sides. The back has a space to accommodate a fire back. The fire dogs are beautifully made with scrolling tops with ball finials and shaped feet. The set is designed to sit within a hearth and a fire surround could be added. We have several fire surrounds available for sale, please see our other listings for details. The set is reclaimed and therefore has some slight signs of use and wear. There is some surface rust to the fire grill and fire dogs. Some small marks, scuffs and scratches can be seen on the basket and fire dogs. The basket has previously been used for fires. The fire set is of a good size, perfect for a living room or dining room and would add character and charm to a hearth.